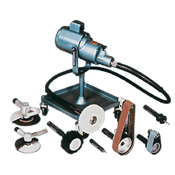 Working with a variety of jobs and applications usually means acquiring a whole lot of different tools and machines. Not so with these Suhner flexible shaft machines. Here we have versatility, adaptability, and convenience together with full power – from the most precise work in mobile operations to heavy-duty work under extremely difficult conditions. The separation of the drive unit from the tool provides for complete freedom of operation, without fatigue, during long working periods. 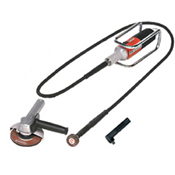 Additionally, areas difficult to reach with other tools can be worked effectively with these flexible shaft machines. The Suhner line of flexshaft units includes single speed, multi-speed, and infinitely variable speed motors. 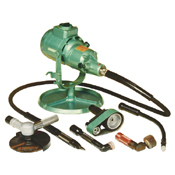 Available operating speeds have been carefully selected based on practical tests to help provide optimal cutting and surface speeds for stock removal with burrs, abrasives and finishing supplies. 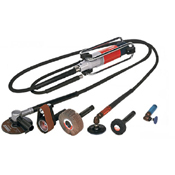 The extensive assortment of accessories provides the greatest possible versatility of these Suhner flexshaft machines. 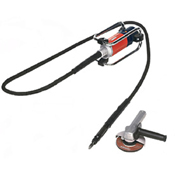 The Suhner designed slide coupling allows for rapid changing of toolholders and attachments to the flexible shafts.